Style4men.ca was started as a side project to learn the WordPress web blogging interface. I was already quite passionate about pomade and wet shaving so it seems to be a perfect pretext for the web site. Little did I suspect that it would grow to be what it is today? I find myself having a total blast discovering, learning, interacting, writing, filming and talking about all things grooming. I am pleased to report that the excitement of finding new brands and new products and solutions is not fading. Further to that, the industry as a whole is continuously growing and more and more brands and products are appearing making it feel like an unstoppable and awesome wave. As part of that wave is the Victory Crown Barber Co. from California. 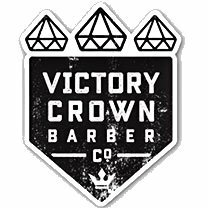 Victory Crown is the brain child of Master Barber Anthony Giannotti, who like many other passionate people had a vision and expectations that were not met by the available products. The only reasonable solution being to concoct and create your own products, which he did. 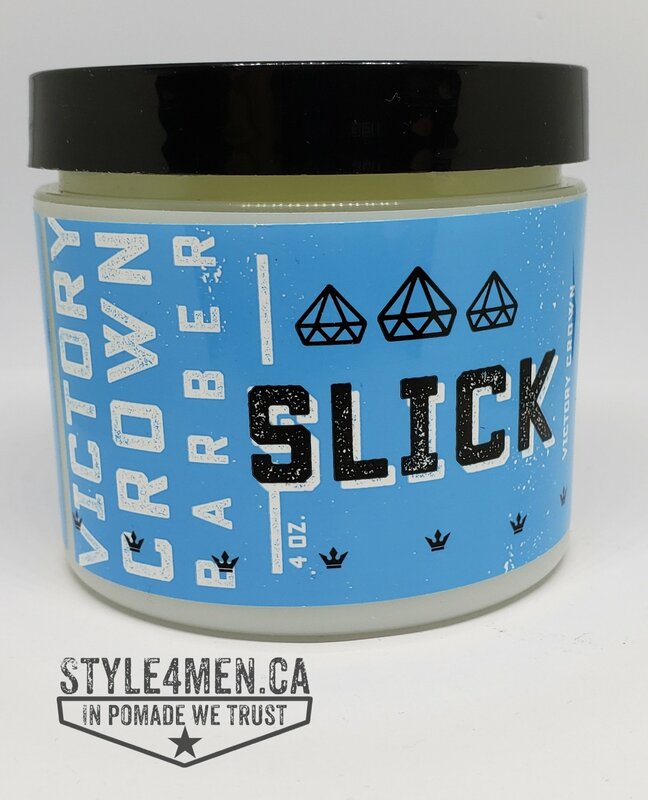 I came across this brand a few months back as part of my regular quest for pomades. Anthony’s story rang home and the overall product presentation convinced me that this was a line I had to explore. Fast forward to today and here we are with 3 jars! The MATTE, PASTE and SLICK pomades. 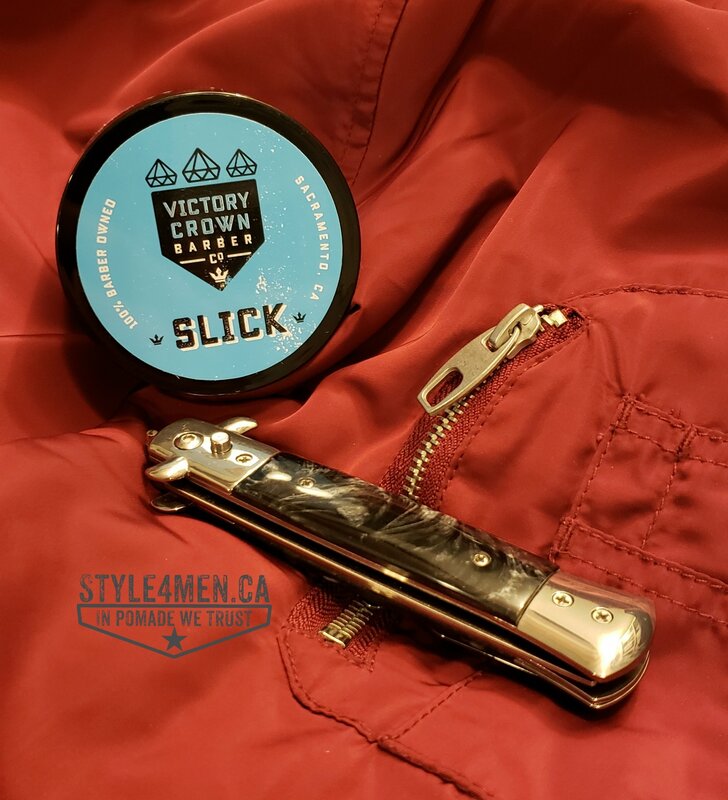 This review will focus on the SLICK pomade. The branding of the Victory Crown line is: simple, retro looking, unique and convincing. The stylized shield like shape and choice of colours won me over. In the case of the SLICK jar, the blue label is nearly alone in the pomade world. Upon opening the jar you are presented with a shiny jello texture. Shinier that most water pomade. That is because there is an element of castor oil. 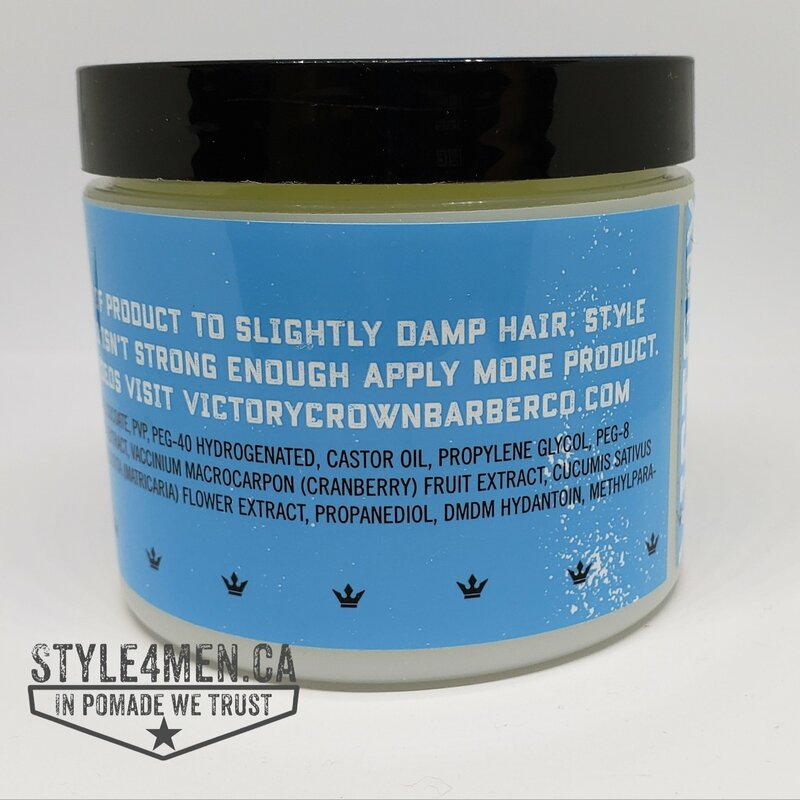 Water based pomade with a high level of castor oil usually tend to offer excellent shine which is rare in a water pomade, but the down side is the limited hold. Having unruly hair, my No. 1 interest in a pomade is “hold”. My preoccupations were very quickly dismissed after scooping about a nickel size portion and blending it in my palms. The pomade was appropriately sticky. This was further confirmed when applying it to my mope. Fantastic hold! Easy to work in the hair and to style. No tugging or excessively quick drying. Everything was just right. I should mention that I applied this pomade to clean and dry hair. Since I like to sport a big pomp, I usually dry my hair with a volumizer first and then apply the pomade. This creates a big jungle to work in. 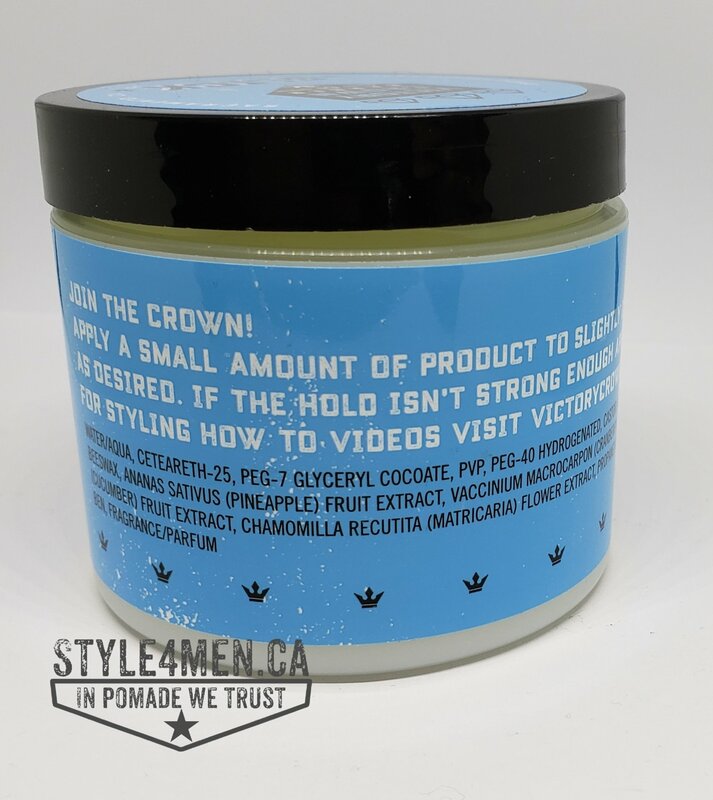 The pomade can style the hair without squashing the previously created volume. The other selling feature is the scent of this pomade. My nose first suggested pineapple to me, but it is in fact bitter apple. The ingredient list does identify pineapple so you might smell it. Regardless, what is worth mentioning is that is unique scent offering in a pomade and this is the first time I have come across it. The aroma is perfectly gauged and is strong enough for people in your close circle to maybe identify it, but it certainly won’t disturb. If anything, I got good reactions to it. Important to note, our very own asthmatic Mrs. Style4men.ca approved and had no reactions. There is no doubt that this is a firm hold pomade and I got essentially 8 hours of committed hold. By the end of the business day, I needed to restyle and re-apply a tad. In closing, this pomade lives up to its retro-cool labelling. 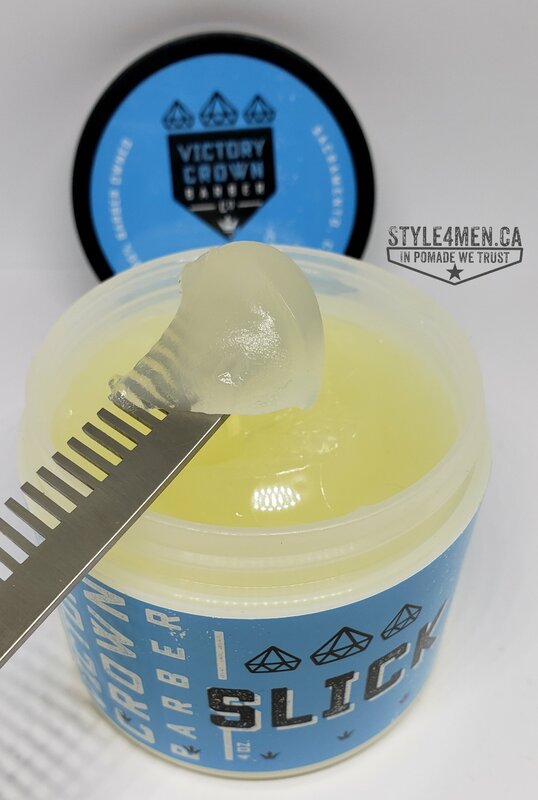 You will find a uniquely scented water based product that holds for real without having to commit to multiple days as you would with an oil based pomade. The skinny version: I loved it!